Glue Dots are double-sided adhesive dots that bond instantly to almost any surface including paper, plastic, metal, glass, wood, foam, fabric, and more. 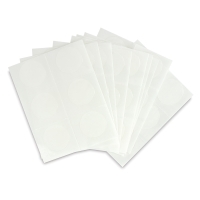 They're completely non-toxic, acid-free, and so convenient, you'll wonder how you ever did without them. XL Glue Dots are great for heavier materials like wood or metal embellishments, thick cardstock, fabric, or handmade papers. They measure 1" diameter and come in sheets. 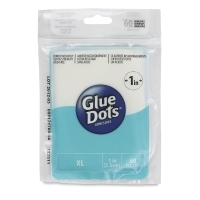 ® Glue Dots is a registered trademark.